Welcome to Dartmouth Youth Lacrosse. We have a number of exciting events planned and a great lacrosse season to look forward to! Registration is open to boys and girls in the 1 st through 8th grades who reside in Dartmouth. Teams will practice 1 to 2 days a week and games will be played on Sundays. 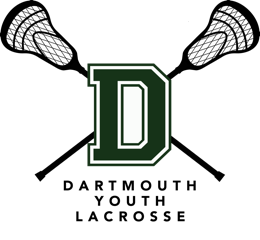 Dartmouth Youth Lacrosse WILL NO LONGER register any players with US Lacrosse. Please note that you will not be able to proceed with your Dartmouth Youth Lacrosse registration unless you are able to provide the US Lacrosse ID numbers. Registration fee for U11 and above Boys and Girls for 2019 will be $175 and will include personalized custom uniforms that you keep. *If you are comfortable with the size(s) chosen at registration you do not have to attend fitting. Payment must be made during registration. Players will not be placed on a team without payment.